Statistics provided by the United States Department of Transportation demonstrate that over 413,000 automobile accidents are caused by truck blind spot accidents each year. Furthermore, of these accidents, nearly 160,000 fatalities occurred as a result. By definition a blind spot is the area around a truck, or vehicle, which the driver cannot see. Often times, truckers refer to these areas as No Zones as they are the areas where passenger vehicles are not advised to travel. Due to the large size of these trucks, they have much larger blind spots than any passenger vehicle, thus blind spot accidents are much more prevalent. If you or a member of your family has been involved in a blind spot accident with a truck, our truck accident attorneys believe the victims may be entitled to compensation for their losses and damages including; medical expenses, pain and suffering, property damages, and in some cases funeral expenses. To learn more, we welcome you to complete the Free Case Review form Its 100% free. According to the Tennessee Department of Safety and Homeland Security there were 104 fatalities caused by large truck accidents throughout the entire state. Additionally, statistics show that passenger vehicles traveling in a trucks blind spot are one of the top causes of truck accidents. As a result of the incredible number of fatalities caused by blind spots, our attorneys have gathered some information on how to avoid truck no zone accidents. As trucks are enormous in size, they have extremely large no zones on both sides. Therefore it is advised to make sure you can spot the drivers face in the rear-view mirrors to assure you can be seen. This will allow the driver to react if they need to change lanes or perform a quick maneuver. Many drivers fail to recognize the enormous no zones that trucks have directly behind them. Therefore, truck drivers cannot see if there is someone traveling behind them. As a result, there have been many rear-end collisions due to trucks reacting to a hazard and slamming on their breaks. Our attorneys advise to not travel too closely behind a large truck. As a truck takes nearly twice the time to stop than a passenger vehicle, it is advised not to pass to closely in front of these trucks. This maneuver is extremely dangerous and can result in extreme injuries and possible death. Due to the enormous size of trucks, they often require a larger turning radius; as a result they may need to swing wide to the left in order to successfully turn right. This means that cars may try to pass on the right, where truck drivers will fail to recognize their position. By following these simple tips, drivers will be able to avoid a trucks no zones and avoid becoming involved in an accident with these large automobiles. In some cases, drivers may fail to recognize when they are traveling in a drivers no zone, thus resulting in an accident. These accidents are typically severe and cause severe damages, injuries, and possible death due to the large size differential between the average 3,000 pound passenger vehicles versus a fully loaded 80,000 pound truck. If have been involved in a blind spot accident with a truck, it is advised to seek medical attention as soon as possible. This medical attention will not only ensure your safety, but will also provide you with necessary medical documents to build a robust case against these negligent injury causing individuals. At Greg Coleman Law, our personal injury attorneys are sympathetic towards drivers injured due to the negligent actions of another individual. Therefore, our attorneys will work relentlessly to achieve the maximum compensation benefits available in the court of law. 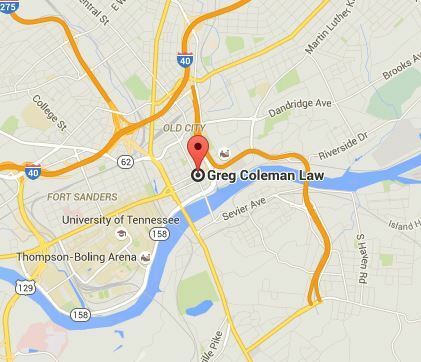 With our main office located in Knoxville, Tennessee our attorneys are able to serve clients throughout the state and elsewhere. If you would like to learn more about our law firm, or to schedule a free no-obligation consultation with one of our attorneys, we encourage you to call us today at (865) 247-0080 and a member of our staff will collect information about your case and connect you with one of our attorneys ready to handle your case. Furthermore, our attorneys all operate on a contingency fee basis, so we will not charge you for any of our services unless a winning verdict or settlement has been made and you recover. Begin here by completing the Free Case Review form on the top of this page Its completely free and confidential.